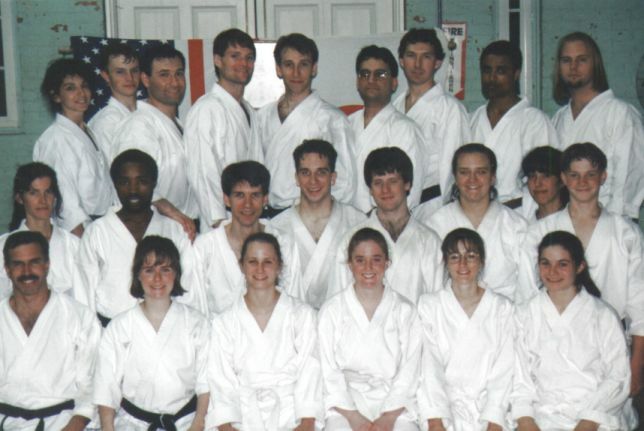 UConn Friday night class, April 1997. Front: Scott Jacobs, Julie Westmoreland, Melissa Lyon, Shannon Ambrose, Tina Kulo, Amy West. Middle: Andrea Fields, Chris Njue, Matt Stroop, Josh Wilbur, Ken Forrest, Beth Jankowski, Peggy Gilbart, Ryan Jacobs. Back: Matte Thomas, Mike Jacobs, Kaarlo Moran, Mark Rollins, Tom Fabian, Sandeep Kaushal, John Seifert, Demissew Ejara, Forrest Young. 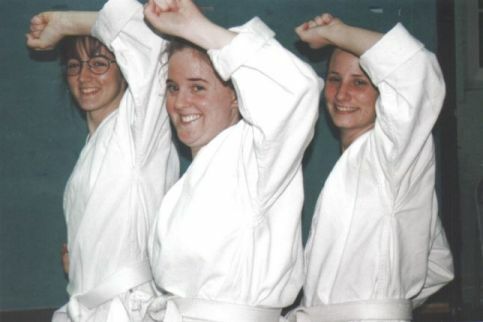 Some serious rising blocks by white belts Tina Kulo, Shannon Ambrose and Melissa Lyon.